Skip Stubbs has been the main force behind many (most?) of the noteworthy diving trips to Guadalupe Island (Isla Guadalupe) during the last two decades. The trips Skip has led began in ’91 and ’92 on the Bottom Scratcher, and continued annually since ’94 on the Horizon, and preceded the current generation of shark trips by ten years. Skip’s Guadalupe trips were for appreciation and exploration of the underwater and coastal wonders of the island and for seeking large tuna and yellowtail that haunt Guadalupe. The main activities were open water SCUBA diving, freediving, and spearfishing. We didn’t do any cage diving in spite of the many sharks that are there; it was all about the open water. Most summers I was fortunate to accompany Skip for the annual 10-day trip, along with a handful of other Guadalupe regulars. East face and shoreline of southernmost morro, daybreak. A sense of solitude and remoteness permeated those trips, particularly the early ones when we were discovering new dive spots each day and were somewhat anxious about the legendary sharks known to patrol the island. We were all acutely aware that we were far from home, in a wild place, and essentially alone except for the folks who shared the boat with us. On most of our Guadalupe trips, we would be lucky to see another boat the entire time we were there, and if we did it was usually there briefly seeking a protected night anchorage. Otherwise we, and the small group of Mexican fisherman living on the island, were the only people at the island. Each evening as we drank Jerry’s wine and beer, ate fresh yellowfin off the grill and traded stories of what we had seen in the water that day, we all knew how really special our time at the island was. Many commented that those trips were the most enjoyable of their lives. 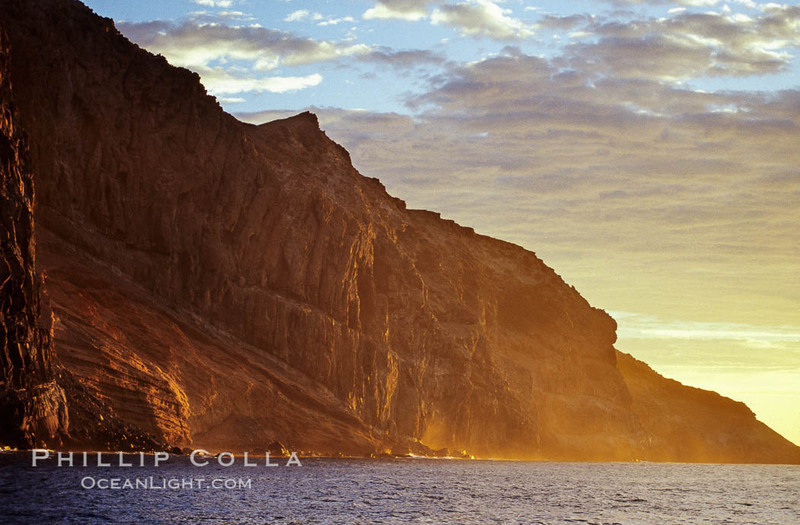 Guadalupe Island is now a Mexican Biosphere Reserve, and access to the island is increasing regulated and limited. Dozens of shark diving groups arrive by boat at the island throughout the fall months, sometimes four of them simultaneously, in general anchoring at a single location near the north end of the island. While the magic sense of solitude, privacy and privilege that we experienced is likely absent from these trips, at the same time many more people are now able see this amazing place with their own eyes than before. The memories of Guadalupe Island, the moments of drama there and the people I shared these adventures with will stay with me for the rest of my life. Our trips on the Horizon have always been a highlight of my summer for the better part of my adult life. I knew so little about bluewater hunting back in 1994 but was full of ambition having heard the stories and exploits of freedivers at such places as the Revillagigedos and other offshore rocks. I had never shot a tuna or yellowtail until I got to Guadalupe. This was the place I learned to stalk pelagic fish, dive in bluewater, work together with other divers for safety as well as to ensure we each succeeded in landing our catch and enjoy the finer points of home brewed lager on tap! You have done a tremendous job of organizing the annual run to Guadalupe. I always looked forward to seeing the old faces as well as seeing the newcomers. Your efforts to only bring in the right people for this special trip is probably this single most under appreciated aspect of all the trips we’ve shared. I will always be thankful to you for taking the effort keep the trip going with the right mix of divers. Well said, Joe. See you on the water.